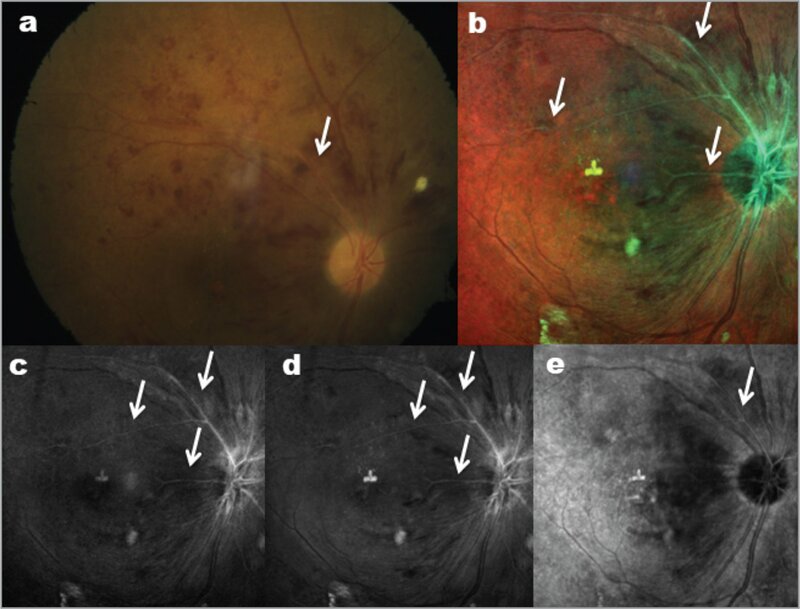 To analyze the visibility of various diabetic retinopathy lesions in multicolor imaging (MCI) and compare them to corresponding color fundus photography (CFP). Retrospective review of 130 eyes of 65 consecutive patients with diabetic retinopathy who underwent multicolor confocal scanning laser ophthalmoscopy and CFP. Hard exudates (Hex) were seen in 74 eyes (71.2%). In all 74 eyes, Hex were visible on both CFP and MCI. Among other color channels, Hex were picked up most in green reflectance (GR) images in 73 eyes (70.2%). Cotton-wool spots (CWS) were picked up in 29 eyes (27.9%) on MCI and in 27 eyes (26%) on CFP. In both GR and blue reflectance (BR) imaging, they were equally picked up in 29 eyes (27.9%). Retinal hemorrhages were picked up in 83 eyes (79.8%) on MCI and in 82 eyes (72.8%) on CFP. Among other channels, they were picked up most in GR images in 81 (77.9%) eyes. Hex, CWS, and hemorrhages were seen better on MCI and in GR images as compared to CFP, BR, and infrared imaging, respectively. With CFP as the comparator, the sensitivity and specificity of MCI to detect of these lesions were more than 90%. The authors' pilot study validates the efficacy of MCI in picking up lesions of DR vis a vis CFP. MCI has potential to replace CFP in clinical and DR screening setting. The prevalence of diabetes mellitus (DM) is alarming, and by the year 2035, it is projected to approach 600 million people worldwide.1 Diabetic retinopathy (DR) is the commonest complication of diabetes and one of the major causes of acquired blindness in the working-age population throughout the world.2 Therefore, early detection of DR and diabetic macular edema (DME) through screening programs and subsequent referral for therapy are vital to preserve vision in individuals with diabetes. Color fundus photography (CFP) is the gold standard to document fundus lesions in DR. It is used in screening programs, for documentation in clinical trials, and in treatment follow-up.3 CFP has various limitations, which include need for dilated pupil and discomforting bright white light for image acquisition. Multicolor imaging (MCI) is a new, noninvasive retinal imaging modality available with the Spectralis platform (Heidelberg Engineering, Heidelberg, Germany).4 It simultaneously acquires three reflectance images of the retina using three individual lasers producing a composite image, thereby allowing analysis of changes at various levels within the retina. Utility of MCI has been described in various disorders like epiretinal membrane (ERM), age-related macular degeneration (AMD), and optic nerve head edema.5–8 A single paper in the literature describes MCI imaging characteristics of DR. We present a large series of patients with DR and highlight its MCI imaging signatures.9 The current study aims to describe the MCI signatures of individual retinal lesions in DR and validate them with corresponding CFP. This was a retrospective study carried out in a tertiary eye care center in Eastern India. The study period was between January 2017 and October 2017. 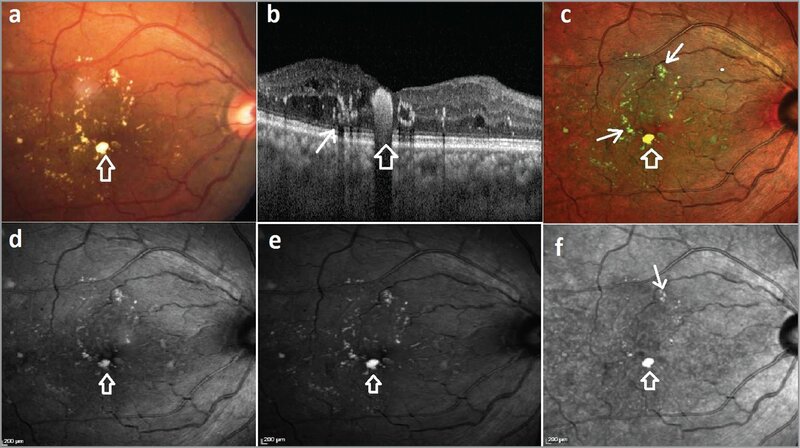 Consecutive patients with DR who required fundus fluorescein angiography (FFA) and optical coherence tomography (OCT) were included in the study. It is a protocol in our institution to get the color fundus image while doing the FFA. The MCI was obtained during the OCT scanning. Only patients who had undergone both the imaging in the same day were included. All patients underwent a complete ophthalmic evaluation, including dilated fundus examination. Chart review of all patients were done to obtain demographic data, lens status, and grades of DR. Patients with dense cataract, vitreous hemorrhage, co-existent macular disorders, and poor image quality were excluded. Images with prominent lens reflex on MCI were also excluded. Institutional review board approval was obtained to review patients' records and images. The study adhered to tenets of Declaration of Helsinki. CFP was performed with FF 450 plus fundus camera (Carl Zeiss Meditec, Jena, Germany). MCI was performed using the Spectralis. Fundus photography and MC images were captured only when pupillary dilation was accomplished. Both CFP and MCI images were captured with fovea centering. All participants also had high-resolution OCT performed on the Spectralis. Images were viewed using Heidelberg Eye Explorer (version 1.7.1.0) and the HRA Spectralis Viewing Module (version 5.7.5.0). CFP images were viewed in the same system with highest screen setting. Images were graded by a fellowship-trained retina specialist (KS). Infrared reflectance (IR), green reflectance (GR), blue reflectance (BR), and composite MCI were evaluated for presence of various DR lesions and compared to CFP. Visibility across all the imaging types was noted. It was also determined in which imaging modality a particular lesion was seen best. Various lesions that were evaluated included retinal hemorrhages, preretinal hemorrhage, hard exudates (Hex), cotton-wool spots (CWS), ERM, and sclerosed vessels. Data were entered to Microsoft Excel version 14.0 (Microsoft, Redmond, WA), and SPSS version 20.0 statistical software (SPSS, Chicago, IL) was used for analysis. Descriptive statistics and sensitivity and specificity values were calculated with MC and CFP as reference alternately. The current study evaluated 65 consecutive patients with DR who underwent OCT and FFA. Out of a total possible 130 images, 26 were of ungradable quality. A total of 104 images were available for study. Mean age of the patients was 53 years (range: 23 years ± 9.3 years). The right eye was involved in 54 cases and the left eye in 50 cases. Various DR lesions included for analysis were Hex, intraretinal hemorrhages, preretinal hemorrhages, CWS, ERM, sclerosed vessels, and fibrovascular proliferations. Figures 1 to 5 show illustrative images of all lesion types studied. Table 1 enumerates the visibility of various lesions of DR across various imaging modalities. (a) Color fundus photograph of right eye shows yellowish hard exudates (Hex) at the macula with bright yellow Hex plaque (white blank arrow) inferotemporal to the fovea. (b) Spectral-domain optical coherence tomography image of the right eye shows intraretinal edema. Hex plaque is seen as a hyperreflective zone (white blank arrow) temporal to the fovea, extending from the inner plexiform layers to the outer nuclear layer and casting a posterior shadow. Multiple Hex are seen temporal to Hex plaque (white arrow). (c) Multicolor composite image of the right eye shows multiple greenish-yellow Hex (white arrow). Hex plaque (white blank arrow) is seen as greenish-yellow plaque near the fovea. (d) Blue reflectance (BR) image of the right eye shows Hex plaque (white blank arrow) smaller in size compared to the composite MC image. BR images of the retinal surface and superficial layers of retina. Hence, it captures the extent of Hex plaque, which is causing alteration in the retinal contour at that point and within the superficial retinal layers, leaving behind the deeper extent of Hex plaque. (e) Green reflectance (GR) image of the right eye shows larger size of Hex plaque compared to the BR image and shows more numerous smaller Hex over the macula compared to the BR image. Since GR captures features of the inner retinal layer, it shows larger size of Hex plaque compared to BR because the plaque is located mainly in the inner retinal layers, as seen in Figure 2b. GR is able to image smaller Hex better than BR because Hex are present in inner retinal layers. (f) Infrared reflectance (IR) image of the right eye shows Hex plaque (white blank arrow), whose size is similar to that seen on GR but larger than BR. This is because of deeper extent of Hex plaque in this case. Smaller Hex (white arrow) are less numerous in IR compared to BR and GR images because IR captures features of outer retinal layers and shows where smaller Hex are less numerous in this case. (a) Color fundus photograph (CFP) of the right eye shows multiple retinal hemorrhages. Faint retinal hemorrhages (white blank arrow) are seen nasal to the fovea, near inferior vascular arcade. (b) Multicolor composite image of the right eye shows retinal hemorrhages, which appear darker compared to CFP. Retinal hemorrhages (white blank arrow) nasal to the fovea are visualized more discreetly compared to CFP. (c) Blue reflectance (BR) image of the right eye shows retinal hemorrhages, which appear less well-defined than the green reflectance (GR) image (d). Faint retinal hemorrhage is noted nasal to the fovea (white blank arrow). (d) GR image of the right eye shows retinal hemorrhage, which appears better defined than with the BR image (c). Retinal hemorrhages nasal to the fovea (white blank arrow) appear more discrete compared to the BR image (c). (e) Infrared reflectance of the right eye shows retinal hemorrhages, which appear less well-defined than the GR image (d). Retinal hemorrhage nasal to the fovea (white blank arrow) appears better defined than in the BR image (c). Superficial retinal hemorrhage (white arrow) is less discrete compared to the BR (c) and GR (d) images. (a) Color fundus photograph shows cotton-wool spots (CWS) as white, fluffy structures. (b) Spectral-domain optical coherence tomography line scan shows thickening and hyperreflectivity at the level of retinal nerve fiber layer characteristic of CWS. (c) Multicolor composite photograph highlights the CWS as bright green lesion. (d) Both blue reflectance (BR) and green reflectance (GR) images highlights the CWS. (e) Infrared reflectance image shows the CWS, albeit faintly, as compared to BR and GR images. (a) Color fundus photograph shows laser marks (arrow) and epiretinal membrane as fine striations (arrowhead). (b) Spectral-domain optical coherence tomography line scan through the fovea shows the epiretinal membrane (ERM). (c) Multicolor composite photograph highlights the ERM as bright greenish lines. (d, e) Both blue reflectance and green reflectance images show the ERM. (f) Infrared reflectance image, which highlights deeper structures, does not show ERM. (a) Color fundus photograph (CFP) shows sclerosed vessel as faint white lines. (b) Multicolor composite image (MCI) shows the sclerosed vessel as a green line. MCI picks up more sclerosed vessels, which are not appreciable in CFP. (c,d) Blue and green reflectance images highlight the sclerosed vessels as bright white lines. (e) Infrared reflectance image fails to highlight sclerosed vessels. Hex were seen 74 eyes (71.2%). In all 74 eyes, Hex were visible on both CFP and MCI. Among other color channels, they were picked up most in GR images in 73 eyes (70.2%). Hex were seen better on MCI and in GR images as compared to CFP, BR, and IR images, respectively (Tables 2 and 3). CWS were picked up in 29 eyes (27.9%) on MCI and in 27 eyes (26%) on CFP. In both GR and BR imaging, they were equally picked up in 29 eyes (27.9%). CWS were seen better on MCI and in GR images as compared to CFP, BR, and IR images, respectively. Retinal hemorrhages were picked up in 83 eyes (79.8%) on MCI and in 82 eyes (72.8%) on CFP. Among other channels, they were picked up most in GR images in 81 eyes (77.9%). Hemorrhages were also seen better on MCI and in GR images as compared to CFP, BR, and IR images, respectively. ERMs were picked up in nine eyes (8.7 %) on MCI and in eight eyes (7.7%) on CFP. Among other channels, they were picked up most in GR images in nine eyes (8.7%). They were seen better on MCI and BR images as compared to CFP, GR, and IR images, respectively. Sclerosed vessels were picked up in 21 eyes (20.2%) on MCI and in eight eyes (7.7%) on CFP. Among other channels they were picked up most in GR images in 21 eyes (20.2%). CWS were seen better on MCI and in GR images as compared to CFP, BR, and IR images, respectively. Agreement between CFP and MCI was evaluated for three predominant lesions in our series: intraretinal hemorrhages, CWS, and Hex. With CFP as the comparator, the sensitivity and specificity of MCI to detect of these lesions were more than 90% (Table 4). 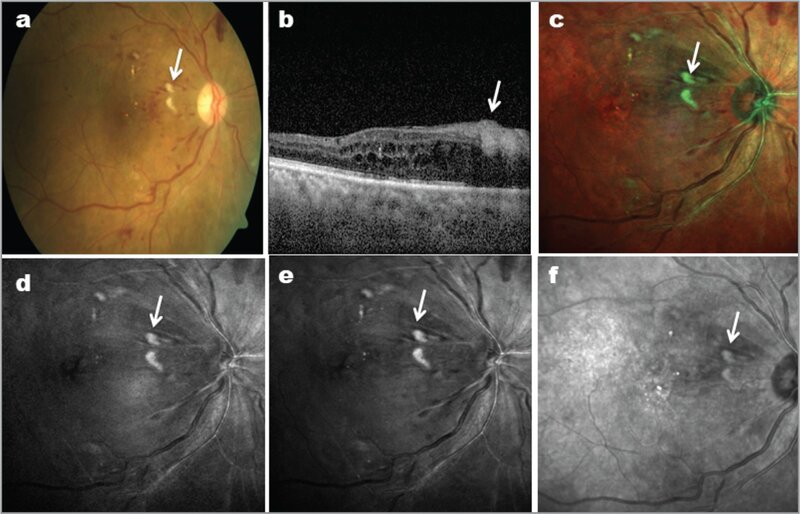 DME is a major cause of vision loss.1 It is important to image the retina in patients with DR from a treatment point of view, and it is also a requirement for numerous ongoing and future clinical trials. There are three types of fundus photography: CFP, which is the traditional imaging modality used to document retinal lesions; red-free imaging; and stereo fundus photography. Stereoscopic photography requires trained personnel for image capture and, thus, is difficult to use routinely. Literature on MCI is sparse. Mufuoglu et al. studied the visibility of ERMs and macular pucker on MCI and compared it to CFP.5 ERM was visualized significantly better in MC and among all the reflectance images, it was best seen in GR imaging. Graham et al. have validated MCI against CFP for features of AMD. With CFP as the gold standard, the sensitivity values for MC ranged from 100% for atrophy, non-geographic atrophy hypopigmentation, and fibrosis to 69.7% for pigment clumping. They reported a specificity value of more than 80% for all features.6 No previous study has validated visibility of DR lesions in MC as compared to CFP. The current study aimed to validate visibility of DR lesions in MCI vis a vis CFP. 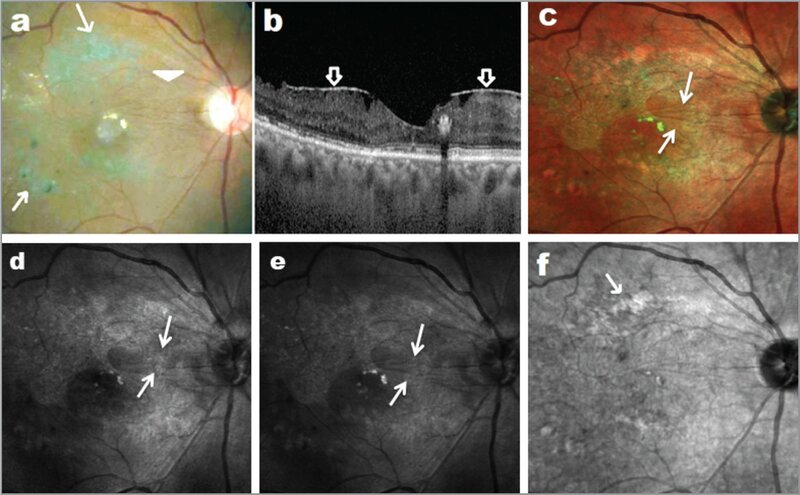 The various DR lesions / characteristics analyzed in this study are preretinal hemorrhage, retinal hemorrhages, Hex, CWS, ERMs, and sclerosed vessels. From an imaging point of view, DR lesions can be classified into “red lesions” like microaneurysms, hemorrhages, and intraretinal microvascular abnormalities, and “bright lesions” like Hex and CWS.12 Microaneurysms are the hallmark lesions of DR. They usually present as red dots and can be distinguished in fundus only when their size exceeds 30 μm. Hemorrhage is usually round or oval in shape and formed by the rupture of microaneurysms. Various types of hemorrhages are seen. They are dot, blot and flame, preretinal, and hemorrhages. It is very difficult to distinguish dot hemorrhages from microaneurysms. Flame hemorrhages correspond to bleeding into the RNFL. They have an elongated shape and conform to the structure of the nerve fibers. Blot hemorrhages are caused by leakage of blood in deeper retinal layers. They are larger than dot hemorrhage and usually have irregular borders. Preretinal hemorrhages are caused by bleeding from retinal new vessels. In CFP, retinal hemorrhages are usually seen as dark red. In the present series, hemorrhages were either bright red or dark red in appearance on MCI. Preretinal hemorrhages are usually assumed to be dark red, whereas retinal hemorrhages were bright red in appearance. The sensitivity and specificity of MCI to pick up retinal hemorrhages as compared to CFP was excellent. This contrasts with the report by Graham et al.,6 who had difficulty in picking up hemorrhages using MCI in patients with AMD. We believe this difference is because advanced AMD is associated with retinal pigment epithelial atrophy, which imparts an orangish hue in MCI, thus creating a poor background for the hemorrhage to stand out. We did not evaluate microaneurysms in our study. This is a drawback and can be done in a larger study later. Hex are another important feature of DR. They are waxy, yellow, shiny structures with clear boundary formed due to leakage of plasma from capillaries. On MCI they had two kinds of appearances. Smaller Hex appeared as shiny, greenish-yellow structures and large clumps of Hex appeared as yellowish structures. The sensitivity and specificity to pick up Hex on MCI was more than 90%. In all image sets with Hex, the MCI image was striking, with Hex standing out as shiny, greenish-yellow structures. The current study also evaluated CWS. CWS are fluffy, white lesions caused by infarction of the nerve fiber layer. In CFP they appear as fluffy, white structures with irregular borders. In MCI they appear as greenish-white bright lesions. MCI showed excellent sensitivity and specificity for picking up this lesion, and the appearance in MCI is more distinct as compared to CFP. Apart from MCI, the multicolor technology provides separate images with three color channels. Human fundus is multilayered, with differential pigment distribution at various layers. This accounts for differential visibility of lesions at various levels with separate color channels. With near-infrared light and long-wavelength visible light, it is possible to see deeper fundus structures such as drusen. As the wavelength decreases, the visibility of the deeper structures of the retina is decreased. Similarly, use of intermediate wavelength improves the appearance of intermediate and superficial structures.12,13 A study by Graham et al.6 has noted that that retinal atrophy is best picked up with the infrared channel. Muftuoglu et al.5 noted that the green channel was better to pick up ERM. Li et al.9 have noted that MCI has better ability to pick up microaneurysms and ERMs as compared to CFP. However, they note that visibility of hemorrhages, CWS, and Hex were not different between these two modalities. In the current study we noted that Hex, CWS, sclerosed vessels, and ERMs were seen well on GR images. Superficial location of these lesions mostly accounts for this. Visibility of hemorrhages was equivocal across modalities. This difference between our study and of that by Li et al. may be accounted by the ethnicity induced variations in fundus pigmentations and difference in severity of lesions among study eyes. Our study has few limitations, including small sample size, retrospective design, and non-evaluation microaneurysms. Our pilot study validates the efficacy of MCI in picking up lesions of DR vis a vis CFP. We also describe multicolor signatures of various common DR lesions. From Aditya Birla Sankara Nethralaya, West Bengal, India. Address correspondence to Rupak Roy, MS, Aditya Birla Sankara Nethralaya, No. 147, E.M. Bypass, Mukundapur, Kolkata, 700099 West Bengal, India; email: rayrupak@gmail.com.